Test riding an electric longboard on smooth Mountain View asphalt near Boosted Board headquarters, I am Aladdin on a f--king magic carpet — but with, like, a helmet. Company founder Matthew Tran coasts at my side, providing instruction, encouragement, and — ever-so-gently — urging caution. Riding unattached to a vehicle speeding at up to 22 miles per hour does call for prudence, although perhaps you haven't seen that in every Boosted rider you've observed about town. And I'll bet you've seen them: Their orange wheels spinning and electric engines humming on streets like Valencia. On a remote control reminiscent of a small weapon from Star Trek, Tran shows me how to pull a trigger with my index finger and roll a small wheel forward with my thumb to accelerate. At stop signs and intersections, where you'd have to jump off of traditional skateboards or longboards, Boosted riders just roll that wheel backward to decelerate and come to a stop. Those brakes, which are regenerative, charging the Board's compact battery, are powerful enough to stop you at the bottom of Lombard Street, and that's no coincidence. 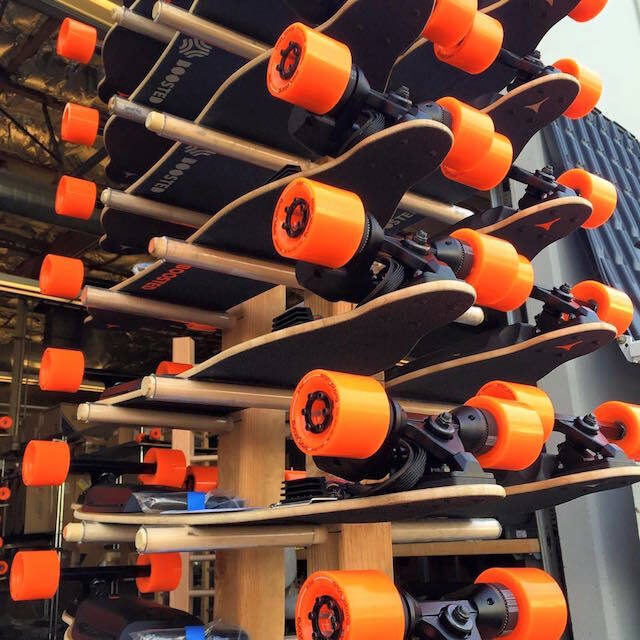 Boosted Boards, which began as a smash-hit Kickstarter project in 2011, are designed, assembled, and programmed in Silicon Valley. But they're built around San Francisco — and not just the hills, although company marketing advertises that you'll carve as easily up those as down them, with some models capable of handling a 25 percent grade. "There's a lot of technophiles here," Tran explains, and many are looking for the next app and the next rush at the same time. These are the "early adopter" types that Boosted wants to attract. According to one rider and Lyft employee, a big chunk of his office gets around on Boosted Boards. "There's a lot of people really into the outdoors — we have Tahoe, we have surfers, we have kiteboarders in this area. 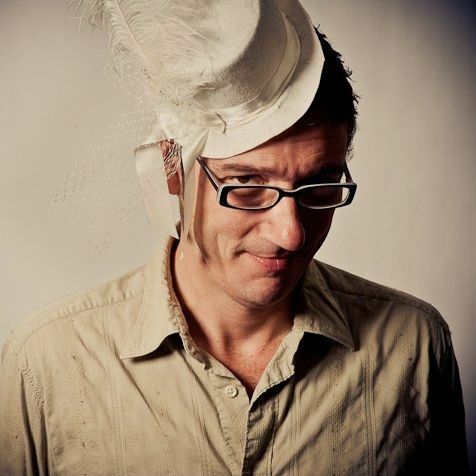 And so yeah, that's one reason San Francisco is such a perfect place for this." Tran knows the type. He and two other Stanford thrill-seeking nerds: Sanjay Dastoor, now Boosted CEO, and John Ulmen, now CTO, started the company together, a new kind of shared adventure. They've now secured two seed rounds of investments in undisclosed amounts, and there's even prestigious baking from Y Combinator and StartX. Inside Boosted HQ, things are part workshop, part startup, coders and tinkerers toiling side by side. Also citing the area, Tran notes that he can recruit engineers and other talent from top universities and companies. 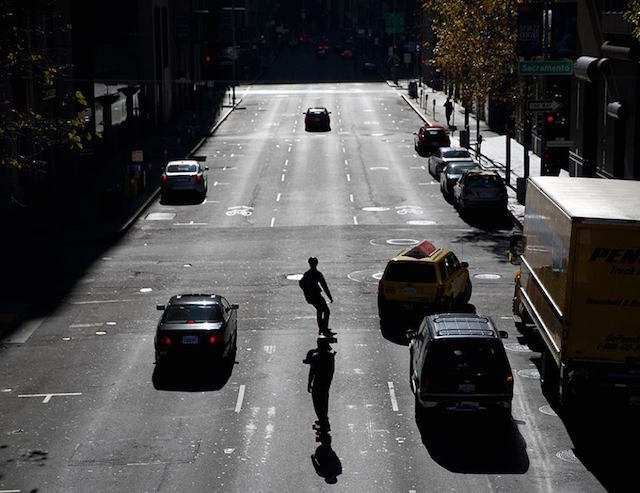 And then, looking outside of the technology, "there's a really rich skate culture in San Francisco," he notes, "there's a lot of skate companies in this area, it's great for all kinds of skating." To promote the board with traditional riders, Tran has even had interest from pro-skater Tony Hawk — Tran calls him Tony — who has test-ridden the board and provided feedback and guidance. Finally, in SF there's what might be called the Muni factor. "It's difficult to get around San Francisco — the public transportation isn't the best, and it's a very dense, smallish city, so the range and performance make it perfect for getting around." That range, in yet another example of the product's San Francisco terroir, is about six to eight miles per charge for current models. Those come in three types: "Single" for $999, "Dual" for $1299, and "Dual Plus" for $1499. Yes, that price, without commenting on it too much, is also right in line with the San Francisco of 2015. One problem with all this: E-boards, a category that encompasses Boosted Boards and a few competitors, aren't exactly street-legal. I'm not sure if riders know that, but it doesn't seem like law enforcement does, and Boosted Boards are in no small part a success because they differ so slightly from regular skateboards in appearance. But the Chronicle had the good news that Governor Jerry Brown just signed legislation reversing a nearly 40-year-old ban on motorized boards. That doesn't go into effect until January 1st, and municipalities can make their own rules about e-boards, included whether or not they can ride on sidewalks and bike lanes. Boosted Boards have, especially locally, grown so much in popularity, and among such a particular crowd, as to merit a subreddit. There, rider/redditors share stories and tips, and mostly talk about how much fun they're having with their boards. Of that particular crowd, unsurprisingly, it's a young male one. If you would ride a skateboard, you would ride a Boosted Board, simple as that. But it's also a smaller market than the general public, and than folks who ride bikes for example, and Tran tells me Boosted could expand on its offerings to capitalize on great battery life and software with other sorts of vehicles, like scooters or even bikes. But to outsiders, those who might already sneer at a skateboarder, Boosted Boards can appear a little like e-cigarettes or their more aggressive cousins, vapes. Both of those are built on a previous product but are fewer, and newer, and less regulated, and less familiar than their predecessor. It's possible that, like with electric bikes someday, e-boards will be ubiquitous enough as to not to turn heads. But then again, these days, it seems like part of their appeal to riders could be that very attention. Of course, cigarettes and skateboards are not the same thing. They're both dangerous, they'll both kill you if you'd like, but in wholly different ways. Still, in the same ways it's unclear what the dangers of e-cigarettes are in comparison to cigarettes, and in the same ways it's unclear what the image of e-cigarettes are in comparison to cigarettes, it remains to be seen what the dangers of e-boards are in comparison to skateboards, and it's way to soon to tell what the image of e-boards will be in comparison to skateboards. For now, then, the Boosted Board is the vape of the road — some people are going to think it's cool, some people are going to love it, and some people are going to be very off-put by it.